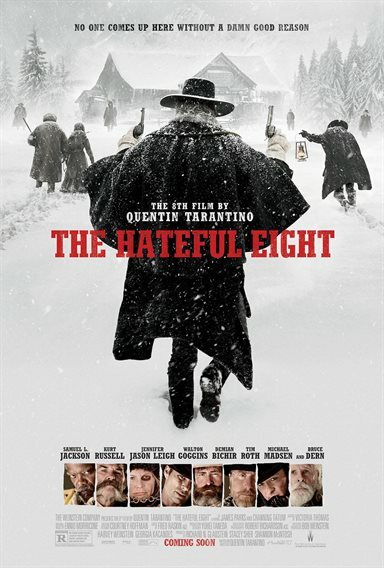 Download The Hateful Eight in Digital HD from the iTunes store. The Hateful Eight images are © Weinstein Company, The. All Rights Reserved. I can't decide if Quentin Tarantino (Pulp Fiction) is incredibly brilliant or deeply disturbed; probably some combination of both. And, I wonder what type of upbringing and young adult experiences shaped him into the person he has become today. Whatever the answers are it has made him a successful filmmaker with a cinematic footprint all his own. His 8th film (which he happily mentions in the open credits) is no different. The Hateful Eight is classic Tarantino with gore and cursing and twists abounding. The script is uniquely identifiable and Tarantino's signature cinematic style is imprinted in every camera angle. Daisy Domergue (Jennifer Jason Leigh; Road to Perdition) has a $10,00 bounty on her head, and bounty hunter John "The Hangman" Ruth (Kurt Russell; Furious 7) is determined to bring her into Red Rocks to collect. Obstacles along the way including an impending blizzard, a second bounty hunter named Major Warren (Samuel L. Jackson; Avengers: Age of Ultron) and a supposed peacekeeper, Chris Mannix (Walton Goggins; Django Unchained) require the group to hold up at Minnie's Haberdashery. Unfortunately, things don't exactly work out as planned. Tarantino decided to pay homage to old school Hollywood, shooting the movie in 70mm film and inserting an overture and intermission. His two act movie plays out like a Broadway play, mainly taking place on one set with a cast of characters feeding off each other, which is not seen in most movies today. The overall feel of the movie is a throwback to the greats of the past and it works beautifully. Although, at one point, I felt as though I was watching a wild, wild, west version of Clue. The cast is fantastic with no one person dropping the ball. With such a great cast, it's difficult to pinpoint any weakness among them. Jackson is strong and stands out but Jason Leigh and Russell are also noteworthy. Tarantino's orchestration of their words and movements plays like a conductor instructing a symphony. The Hateful Eight starts off with a forward momentum that doesn't stop. While the second half isn't as engaging as the first, it does wrap up the storyline very nicely and in true Tarantino fashion. The cinematography is excellent and captures the feeling of 1900's Wyoming. The dialog, unfortunately, does not, and perhaps, showcase one of my few complaints about Tarantino… too much cursing. 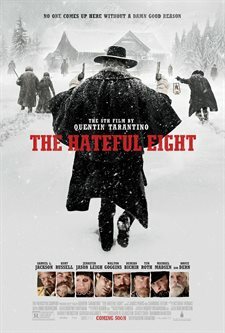 Fans of Tarantino, Jackson and Russell certainly wont be disappointed by The Hateful Eight and will instantly recognize not only Tarantino's unique style but his "mad genius" writing and filmmaking as well. When you go to the theater this week and Star Wars: The Force Awakens screenings are all sold out … The Hateful Eight is an excellent second choice (as long as you aren't with any young kids - It's rated R after all).